Professional Packing & Crating Services - Hutley Van Systems, Inc.
Hutley Van Systems Inc. offers custom packaging and crating services with an extensive network of over 1700 affiliates nationwide. Palletize-Shrink-wrap cartons or packaged items onto a pallet. Palletize and Wrap-Bubble wrap items, wrap items in corrugate and then shrink-wrap onto pallet. Custom Packaging-Bubble wrap items; package wrapped items in a customized carton. Custom Crating-Custom built wooden crates specifically for your fragile or high-value items. Custom Packaging Service Options Foam-in-place Packaging Provides secure factory-like foam cushioning to fill voids for items such as monitors, hard drives, fragile equipment, television sets, stereos, etc. We'll secure your shipment and save you money by shrink-wrapping your goods on to a standard pallet. 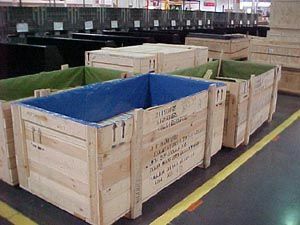 We provide crating services or in-house crating for fragile or time-sensitive shipments for a variety of industries. We offer pickup and delivery of uncrated material. Domestic and International, Air and Ground Services, as well as Ocean Services are available. Hutley Van Systems Inc. offers pick-up of your unpackaged goods. We recommend that you wrap your goods in bubble wrap or paper to help protect them from damage in transit to the packer. If your item is heavy or oversized you might want to request an extra man for the pickup or help the driver load the item if needed.